← Bahrain Center for Human Rights updates list of “extra-judicial killings” to 31 since February 14. List of women in detention reaches 30. 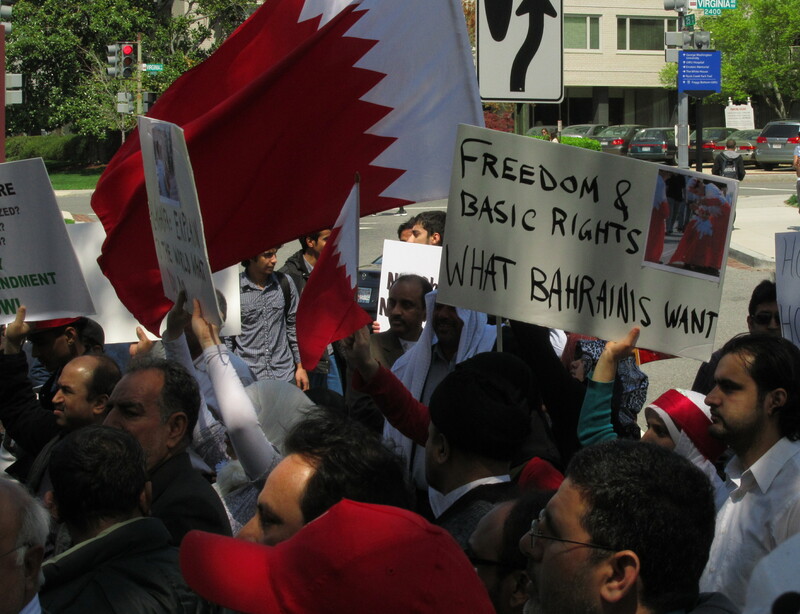 Today’s protest against human rights abuses in Bahrain. Protesters marched around the Saudi Embassy calling for an end to the Saudi Invasion of Bahrain in Washington DC at Nearly three thousand people from varied areas participated as of 3pm this afternoon. The protest is expected to grow as local crowds gather at the White House at the end of the afternoon. This entry was posted in Bahrain movement for a national democratic republic, Gulf States, Saudi Arabia. Bookmark the permalink. I was there today. This is only the beginning. We will not stop until the people of Bahrain are free. i am so happy they started this march at the saudi embassy. the saudi royal family should be ashamed at their unislamic behavior and their violent crimes against peaceful bahraini protestors. i wish the whole world would decide on a day to abstain from buying gasoline and petroleum related products to really let the saudi government have a taste of our economic power. maybe more than one day. let’s do it a month. i am SICK of them mis-using their power. it is one thing to want to monopolize a market and quite another thing to murder innocents to keep your monopoly on the market. and shame on the american politicians who have special interests in the oil market and will not pressure saudi to stop their criminal actions! Poor Shias in Bahrain should not be slaughter like cattles just with a fear that this will give IRAN great influnce in Arab world. please take away our slogan, “LIBERTY & JUSTICE FOR ALL”. The mighty Saudi money has washed away this pride of United States. Where is your Human Rights value? Histry shows that unjust government can not survive. The Government is unjust, suppresive and brutle. Great work guys. At least now Americans now that people is really disappointed with U.S officials response to Bahrain crisis. Most of Americans (non political ) do not know what is going on in Bahrain and they just started to learn about it last week as CNN brought the issue up. Thanks to Amber, CNN reporter. Mashallash a lot of people came to the protests, to inform those who don’t know what is going on in Bahrain. The people of Bahrain are being oppressed by the tyrant and corrupt rulers, and these protests show that we will not let the tyrants keep the news hidden of what they are doing to innocent civillians who want to remove the tyrants in Bahrain. The people at this protest were speaking for all of those innocent civilians and protesters in Bahrain that are not allowed to speak out against the terrible tyrant rulers in Bahrain. Thank for the Report and your interest. Please keep on reporting about Bharain and elsewehere injustice.